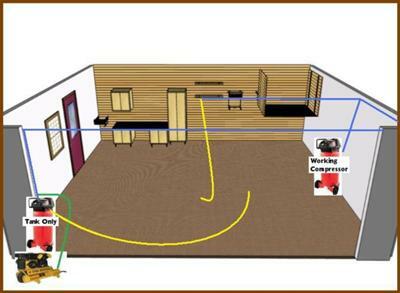 You are here: Home / Combining Two Air Compressors? Some time ago a site visitor wrote in about combing two air compressors. The information being searched for was already on this site, yet wasn’t taken advantage of. The following the string of questions and answers about combining two air compressors will provide more information, yet there is available a full page on information on this site about how to do just that. Read below, leave a question if you wish, or use the search box on the left to see all the pages on this site that respond to how to do this. Connect two air compressors together ?? Can I connect two air compressors together to increase air capacity? You need to tee the outputs to your shop air. And you need to put a check valve in each output line from the compressor before that line gets to the tee. You will want to adjust the pressure switch settings periodically so that the same compressor isn’t coming on all the time, and the other sitting idle, if that’s a concern for you. Essentially, once the air demand drops the tank pressure to cut in, the compressor will start. If demand continues to drop the tank pressure, with the right switch settings, the second compressor will come on to add more air to the lines too. Connecting 2 compressors to get combined pressure and volume. In order to achieve the desired pressure and volume for our pneumatic equipment, I need to inter-connect 2 compressors. 1) Is it necessary that both compressors share the same specs ? 2) Will the resultant pressure and volume be a sum of both compressors? Both good questions, and both covered extensively on the pages of this site already. Answer to question #1 – no. Answer to #2 – no. If each compressor puts out 100 PSI, your downstream air line will not see 200 PSI. What you will do is increase the available compressed air flow at the pressure the system needs. Both compressors will plumb to the same air main to your plant. Both air compressors will have a one-way or check valve in their lines before the two lines connect to the single main. In order for one compressor not to be the one that’s always on first, undergoing greater wear, periodically change the pressure switch settings so that the alternate compressor comes on first. Have a look at Plumbing, Add A Tank, Add a Compressor, and other pages on this site for more details. I have 2 industrial air compressors. Both are 220v 3 phase with one being a 7 hp, the other a 5 hp. I am wanting one compressor to be the primary while the other acts as the secondary to kick during high peaks when compressor 1 can not keep up with peak demand times. I know there are a couple of different ways these can be plumbed together but, am not certain of the best or most recommended way to pipe these up. Suggestions and experience would be greatly appreciated. Hi Bill… I get this type of question about putting two compressors together to increase flow and or have a backup for greater demand, quite frequently. The frequency of the back-up compressor switching on will be predicated on the pressure switch settings of that compressor. If you have the cut in pressure just below the cut-in pressure of the primary compressor, then the secondary will only come on when the pressure level in the primary tank falls below the normal cut in, suggesting that even though the primary compressor is running, it cannot supply enough air. At which point the secondary compressor would start too, even though the primary would be running as well. Both compressors can be plumbed to the same main. Assuming that both lines go to a common tee, and the out port from the tee goes to the air mains, ensure that you have a check valve in the line from each compressor to the tee so that air from one compressor doesn’t back flow and out the unloader valve on the secondary. Any further questions, please add them as a comment here so I can follow the thread. Garage Air Lines, Secondary Receiver, and Combining Compressors. First, yes I am a d-i-y’er and new to the understanding of compressed air. At home I have a working older Craftsman 110v/5hp oilfree 20-gal compressor that claims to put out around 5cfm @90, but is woefully underpowered. I also have a gas powered 5.5hp 9-gal wheelbarrow compressor that supposedly puts out 12.1cfm @100 that I will be using at my warehouse that has no a/c power. After reading up on this site and others, I have a plan that I would like some feedback on. See the attached picture. I picked up a broken 26-gal compressor to use the tank as an additional receiver. I am considering buying the Complete Garage Air Kit from Harbor Freight to plumb as pictured. My questions are many: 1.) Can the additional receiver be as far as 50 feet from the electric compressor? 2.) Can I add the gas powered compressor near to the additional receiver to use in combination with the electric compressor? 3.) Will I actually approach 17cfm with this combination? You can’t run a 5HP compressor with 120 volt power. There’s not enough juice there to power a 5 HP motor properly. Under powered it is, for sure. As to addressing all the implied questions, let me say that all of the answers you seek are on the pages of this site, and it doesn’t make a whole lot of sense to me to re-type all of the existing info here. Please start with the Plumbing page, and go from there. There’s info on adding a tank, adding a second compressor, and so on. Use the site map page to zero in, and/or the search engine on that page. I envy you your proposed setup. I have 2 similar compressors , i want to have them set up so when the primary gets behind and can’t keep up with demand the other one comes on and helps it out at peak usage times. do i need some special switch to do this?? can someone give me an example of how this works correctly? Nope, no special switch. You just use what comes with the compressors, with a bit of creative compressed air plumbing. Have a look at the TWO COMPRESSORS page linked from the site map. What are the precautions to connect 2 air compressors together on same air line? First off, though it was a nice photo, I didn’t think it suited the site or the question, so I deleted it. Second, I’ve written about this issue on a number of pages. Why not visit this page for info on plumbing two compressors together? I have a 50 hp compressor in my air system. I need to increase capacity. I am thinking to add another 50 hp compressor. How would the new compressor connector ? Can it be connected before the current receiver tank ? Do I need a need a second receiver ? Howdy. Since all your questions are already answered in great detail in the pages already on this site, the pages to do with plumbing, adding a tank, a second compressor, compressor water etc. linked from the navigation bar and site map would you please have a read of the info already here, and if you have questions after about items I don’t cover, I would be happy to answer them. If you are interested in further information about combining two air compressors together, please use the Sitemap page to find the many that address this subject, or, leave a question here. You may just get referred back to an existing page or your question might be unique and of interest to all, and I’ll be happy to post if for all to see. Do you have a question about Combining Two Air Compressors? If so, do add it here, and please upload some photos focusing on the problem area?